Providing your kiddos with their own chair will take family movie nights and hangouts in the living room to the next level. Children love having their own space, especially when that space comes in the form of a chair that looks just like mommy’s or daddy’s. We’ve created a list of the ten best recliners for kids. The recliners on this list come in a variety of designs that will look great in several rooms of your home. They are lightweight, thus moving them from room to room won’t be a problem at all. Majority of the chairs are designed with a material that is easy to clean, so your child is free to enjoy their favorite snacks. For this update, we focused on replacing products that were low in stock or out of date with better rated and reviewed items. We also narrowed our list to include only the Top 9 Best Recliners for your child! The Keet Roundy Rocking Chair will look great anywhere in your home. The sleek gingham fabric and the variety of colors available make it easy to coordinate with any decor. This chair is lightweight and can easily be moved from room to room. The wooden frame provides a safe and sturdy foundation for your child to sit in. The foam underneath the fabric will keep your child cozy and comfortable as they rock. Your child will destress with every rock they take. There is a notch on the back of the chair that will keep your child from rocking too far back. Not only is it lightweight but the colors available make it easy to match in any room of your home. One of the truly comfortable recliner chairs for kids we’ve seen is this particular product from Flash Furniture, the BT-7950-KID-MIC-BRWN-GG Contemporary Brown Microfiber Kids Recliner with Cup Holder The super thick padding is sure to bring your child to la-la land in no time especially when it is already time for his or her nap. Pull out the foot and leg rest and watch this reclining seat do wonders for your kid’s ultimate comfort. Watching his or her favorite TV cartoon shows is made super comfy with the built-in cup holder. Your child don’t have to worry about spilling his or her drinks while being immersed in what he or she is watching. Quite a lengthy name for a piece of furniture designed especially for children. However, it really does live up to customer expectations because of its superior construction and superb styling. 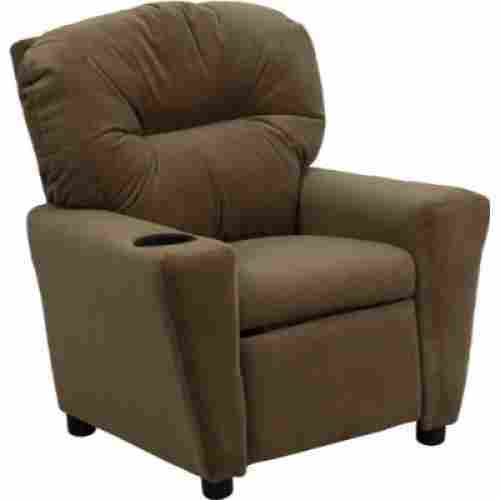 This recliner is well padded with comfortable, durable microfiber upholstery. A recliner allows your kid to fully relax, just as it does for you. This chair is light enough that most kids can take it where they feel most comfortable, whether that’s watching mom cook, sharing a movie with grandpa, or the privacy of their own room with a book or game. The chair will not recline without the kid sitting in it, a safety feature that allows a toddler to use it. Circulation is improved by the prone position, and active muscles are allowed to recover. A kid’s recliner can also help your kid feel closer to the family. Imagine your kid being able to recline in front of a movie just like you, instead of being relegated to an uncomfortable chair. At the same time, this recliner is their own special place to relax. While the piece on the back prevents tipping, it also reduces the level of rocking. 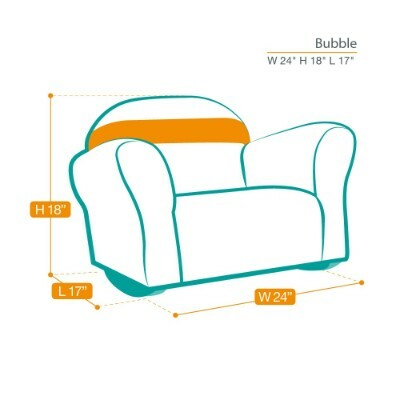 It’s going to be hard to get your child up and moving after they take a seat in the Keet Bubble Rocking Chair. 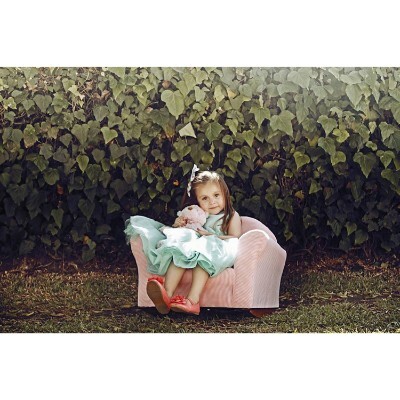 The wooden frame provides a durable and sturdy chair for your little one to relax in. 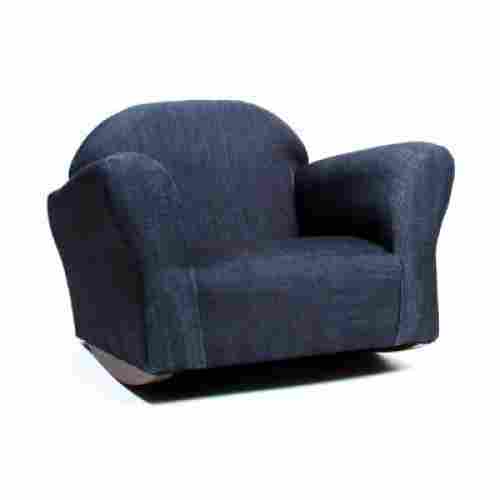 It is covered with a soft denim fabric and is padded with foam for extra comfort. When purchasing you can choose between three different colors. The sturdy frame and the built-in piece that eliminates tipping makes this chair super safe for your little one. The denim fabric can easily be wiped clean. It is covered with a soft denim fabric and is padded with foam for extra comfort. When purchasing you can choose between three different colors. As your child rocks back and forth their stress levels will decrease. The denim material makes this chair easy to clean. The legs can be unscrewed just in case your child would rather use this as a regular chair. For added safety, the chair has a piece in the back that keeps it from tipping when the child is not rocking. Watching TV and movies is an activity that you see kids doing often so why is all the furniture in the house made especially for adults? Well, this is a game changer. This recliner is the perfect size for the kids in the house. It features deluxe padding, leather upholstery, and storage in the armrests that makes a great spot for kids to sit and relax or read a book. 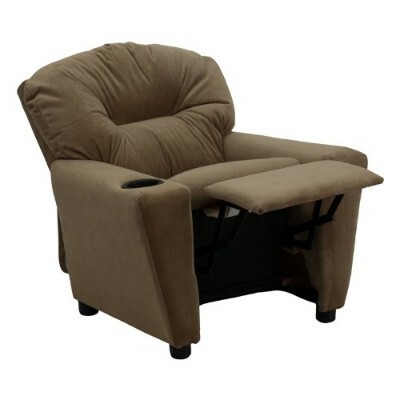 The features of this chair have been created to ensure that it has everything that full-sized recliners have and more. 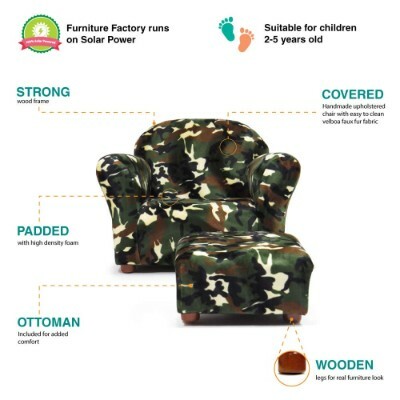 The material used in making furniture for children is designed especially for them and ideal for their use. Having furniture in your home that has been made especially for children ensures that they are safe. When furniture is created for children it is much safer for them because it has been created with non-toxic materials. The armrest storage on this reclining chair for kids is a great feature. It is awesome for them to be able to stick their favorite action figures and small toys in so when they are watching TV they can grab them and play. The reclining position can only be achieved when the child is sitting in the seated position. With safety features, durable upholstery, and extra storage in the arms this is just the recliner that you are looking for. It has been constructed with a sturdy wooden frame and on the outside the durable leather upholstery is durable. It simply wipes clean when any messes have been created on it. 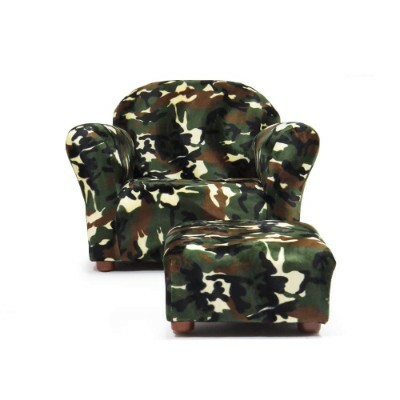 Chair and ottoman sets are a great sitting solution for children. They provide a safe place for them to relax and also gives them a place to rest their feet that can be adjusted as they grow. This set has been designed to enrich the look of any room that your kids may be relaxing in. On the outside of the chair, the fabric that has been used is a durable faux fur. It is easy to wipe clean and feels super-soft to the touch. Advantages of selecting furniture that is durable and easy-to-clean allow children to use it to its full potential. Whether relaxing, reading a book, or watching TV, your little one will love this chair. It has been constructed with both comfort and durability in mind. The frame of the chair has been made with strong solid wood and then covered with foam of high-density to maximize the comfort level. Each piece is handmade and features wooden legs that add to the look. The chair may squeak when your child moves around. 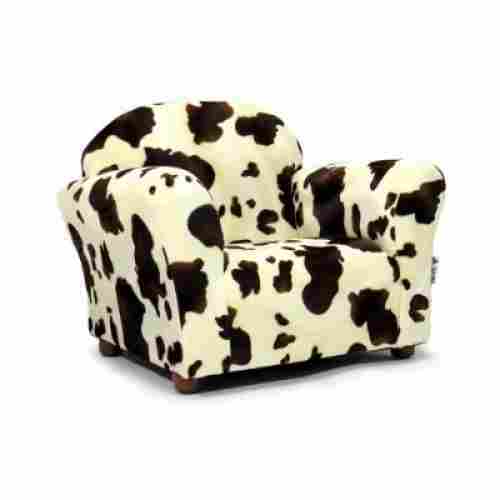 The keet roundy faux children’s chair is perfect for every little cowboy or cowgirl. The frame of the chair is made of a strong sturdy wood. 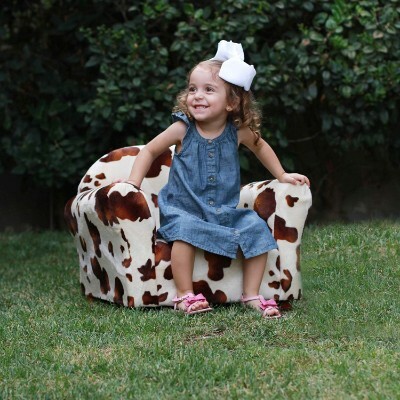 The pony fabric covered chair can hold up to 50 pounds and is great for young children. The Faux fur can easily be wiped clean and vacuumed. When purchasing you can choose between several different design options. This chair is recommended for children between the ages of 2-5. The durability of this chair’s frame and fabric guarantee that it will last as your child grows. 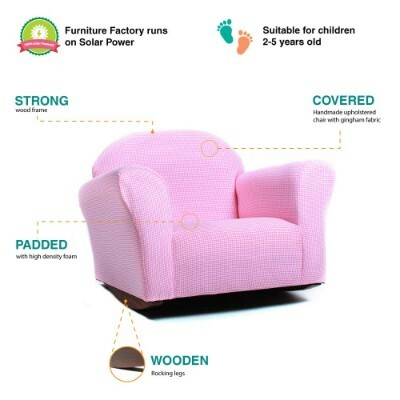 The high-density foam padding provides a super comfortable cushion for your child to relax on. 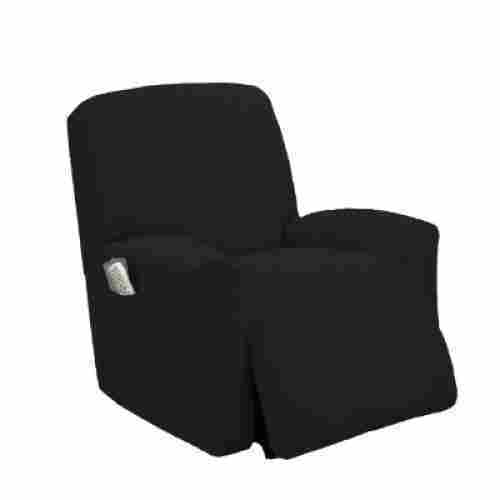 The soft fabric covers a high-density foam padding which makes the chair extremely comfortable to sit in. The fabric itself is also highly durable and will last as your child grows. The wooden legs will keep this chair grounded as your child goes to plop down. The seat part of the cover may fit loosely. Cleaning up messes is all part parenting. 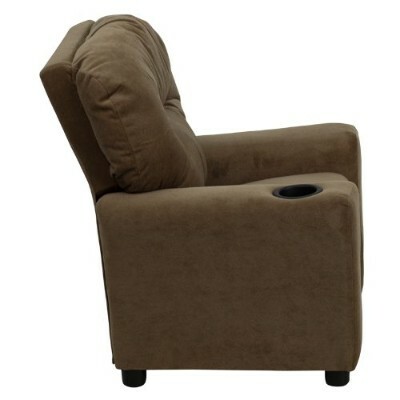 The one-piece stretch recliner cover will protect your child’s chair from spills and pets. Made of an elastic material these covers can easily slip over your child’s recliner. Not only are they easy to apply but the material is soft and comfortable. The slip is equipped with elastic ties at the bottom to keep it tightly in place. When purchasing, you can choose between several different colors to match your chair. When you’re ready to clean the cover, just pull it off the chair and pop it into the washer machine. Each cover comes with a slit on the right side for the recliner level. 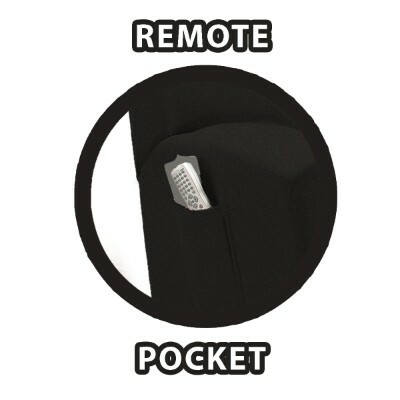 The cover also comes with a pocket that can be used for a remote, game controller, etc. This slipcover will allow you to spend less time cleaning as it provides full protection to your furniture and can easily be thrown in the washer machine. One of the most iconic Disney characters is Minnie Mouse, although not as popular as her partner, Mickey. Nevertheless, Minnie has always been depicted as the ideal partner any man could ever want: loyal, supportive, and very loving. 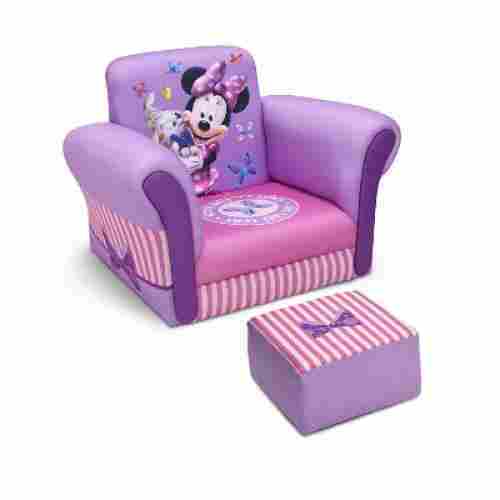 These characteristics will definitely rub onto your own child especially if she has Delta Children’s fabulous Disney Minnie Mouse Upholstered Chair with Ottoman. 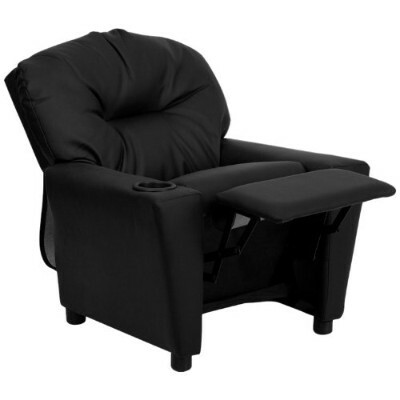 This is essentially similar to the Disney Frozen chair we have also listed here. 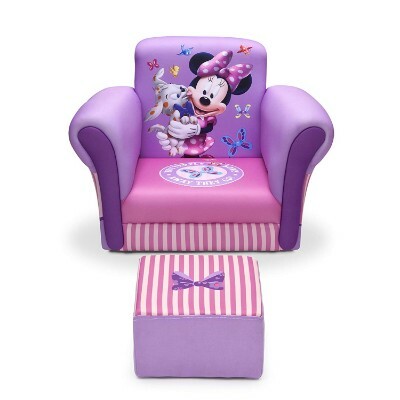 The only difference is that the Minnie Mouse version actually comes with an ottoman so your child can easily stretch her legs while reading her books or even while watching Minnie on TV. 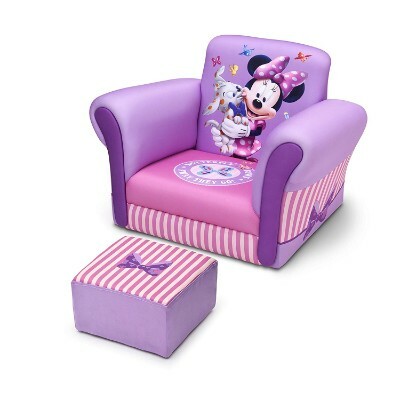 With its elegant purple color with pink and white accents plus a beautiful decal of Minnie Mouse on the backrest, we’re pretty confident your little princess will love sitting on this throne. 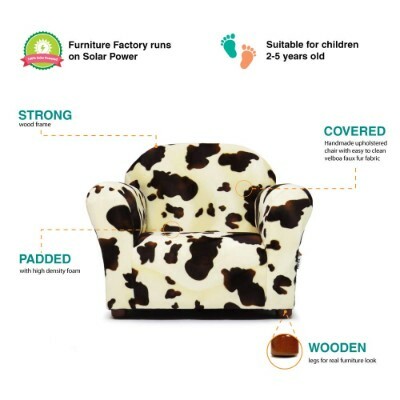 It comes with the same fully padded seat that is built just right for young children between the ages of 3 and 6. Minnie is a perennial favorite of children. She will be a welcome sight for your kid after an active day. The chair’s sturdy construction and extra-wide seat make it comfortable for lounging and rough-housing. The ottoman adds extra comfort for watching tv, reading or gaming. 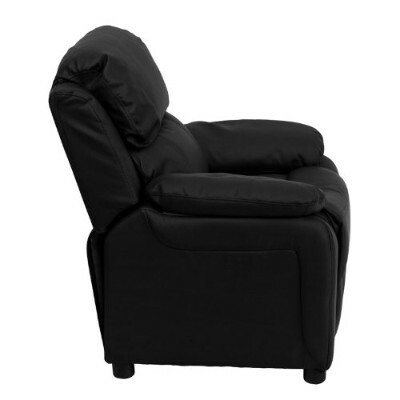 Whether your child is playing video games or watching TV the contemporary leather recliner will keep them comfortable. Especially since it is equipped with plush padding for added comfort. The solid hardwood frame provides your child with a sturdy and stable chair. The leather material will make your child feel like a grown up as they relax in style. The chair is equipped with a cup holder so your child can keep their favorite drink within reach. The leather material can easily be cleaned with a damp cloth so you won’t have to stress about accidental spills. Designed with plastic feet, the chair is slightly elevated off the ground. When purchasing you can choose from over twenty different color options to best fit your child’s taste. Reclining is easy as all your child has to go is gently push on the back of the chair. As they push, the leg rest will slowly rise and the headrest will slowly recline backward. With the plastic caps, you won’t have to worry about the chair scratching your floors when moved. For added safety, the leather material is flame retardant. The seat will only recline when your child is fully seated. 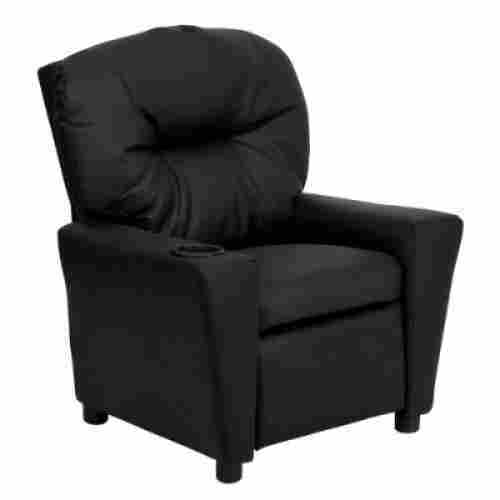 Children up to 90 pounds can enjoy reclining in this chair. Designed just for kids the Crew Furniture Urban recliner is the perfect chair for your little one to get cozy in. 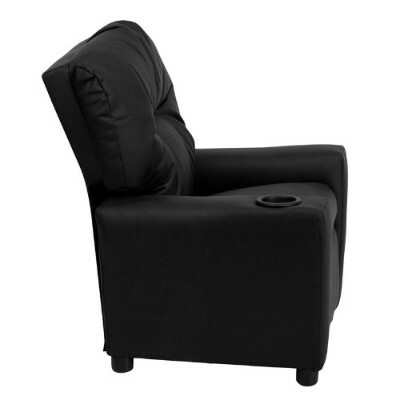 The sleek modern design allows this chair to look great in any room that it is placed in. The polyester microsuede provides a super soft place for your little one to nestle in to. This chair can easily be cleaned with a damp cloth so your little one is free to enjoy their favorite snacks while relaxing. 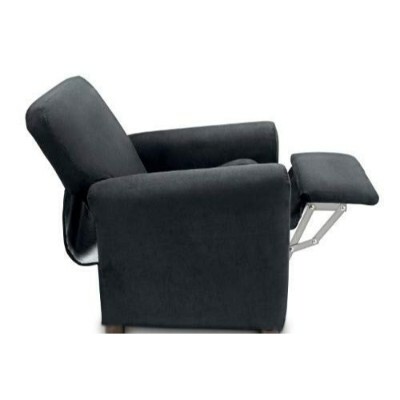 Designed with two armrests your child can prop their arms up to relax comfortably. When your little one is ready to recline they can gently push back in the chair. 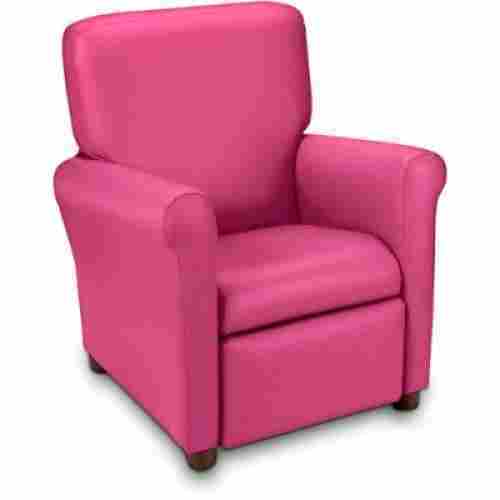 The chair is available in a variety of colors, including magenta. The chair arrives fully assembled so your little one can begin enjoying the comfort of their chair almost immediately after receiving it. The wood frame gives this chair a high level of durability and a stable foundation. Weighing in at 21 pounds, it can easily be moved from room to room. Seeing as how your child will be using their chair daily, we did diligent research to provide you with the best options. When researching each chair, we took into account the construction, attractiveness, and developmental appropriateness. Other factors that we considered included current consumer product ratings and the reputation of the company that made the recliner or chair for children. We know you would also do the same thing. While some individuals may think that kids don’t need recliners or chairs of their own because they can use the ones that adults use, the design and construction of adult-sized chairs may not really be appropriate for the smaller body frames of children. As such, it is a lot better to choose from our top 10 kids recliners and chairs in 2019. Picking a recliner or chair for children is like selecting the best piece of furniture in your home. And since our target users are children, we had to make sure that they are safe, durable, and, of course, super comfortable. A recliner or chair is, first and foremost, comfortable. It should be able to give your child the kind of comfort that he or she needs so that he or she will feel very well-rested. If the furniture has certain features, aside from its comfort seating and backrest, that can help provide an overall relaxing experience, then we considered that, too. It’s no secret that children love to jump and climb on furniture. While you may enforce a strict no jumping rule in your home, we still planned for it to happen. All of the chairs on this list are built with a durable wooden or metal frame. The frame ensures your child’s safety by providing a stable foundation. The rocking chairs included on this list are built with a notch in the back that will keep your child from rocking too far back. We wanted your child to be safe and comfortable in their chair. A lot of the chairs listed are composed of a high-density padding, which will provide a luxurious amount of comfort to your child’s body. 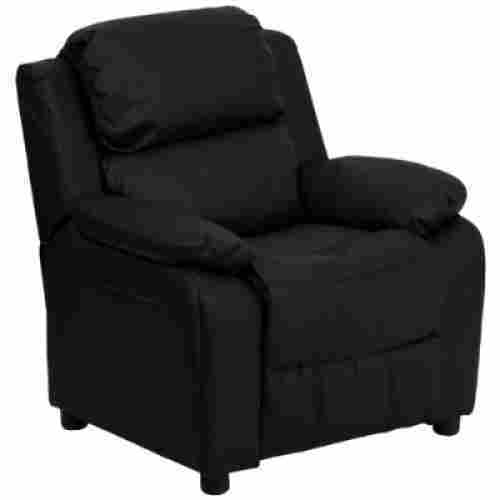 We all know what recliner can do for us adults. These pieces of furniture have all been recommended by health professionals especially in the management of chronic pain as well as musculoskeletal problems of the back and in improving overall circulation. But many adults ask, are these benefits applicable to children who use such pieces of furniture? Child health experts agree that recliners provide the same benefits as those among adults. However, because of the differences in both body size and composition between an adult and a child, the impact of these benefits may be quite different. For example, adults often complain of painful joints which can be relieved by the correct positioning of the reclining furniture. Children, on the other hand, don’t have issues with joint mobility just yet. However, what they do have is the continuing growth and development of the bones, joints, and muscles. These structures must be adequately supported so that unnecessary stress and strain can be avoided on these developing structures. This helps promote complete motor development among kids. Safety is a very paramount concern for any product that is designed for kids. This is because of the fact that children are more prone to injuries as well as other health problems because of still-immature immune system functioning. As such, it was imperative for us to make sure that all of the products we included on our list have been duly tested and certified to be safe so as not to endanger the health and safety of our young members of the household. 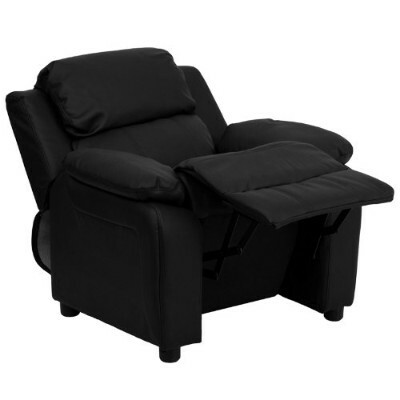 Another area that recliners can be useful is in the enhancement of blood circulation. For adults, this is needed to help prevent swelling of the legs as well as the development of varicosities. For children, this is far from happening. Instead, the improved circulation will help provide the necessary nutrients that all cells and tissues need. This is more pronounced in the brain where adequate oxygenation is needed to help ensure optimum brain development. If oxygen and nutrients are not adequately supplied to the brain, the child’s cognitive development including memory, intelligence, learning, language, speech, and a whole lot more, may progress at a much slower rate. This can have profound consequences on other aspects of the child’s development. Recliners also have been used in the management of stress by making us feel more relaxed. 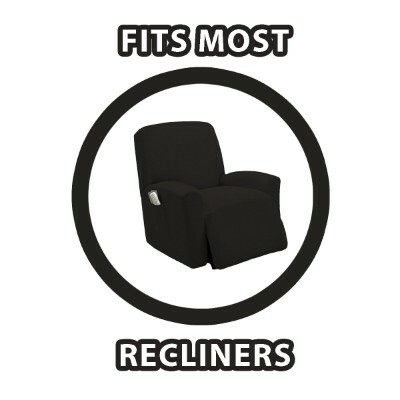 This is an area where there’s no significant difference in the benefits derived by children and adults from recliners. Both will feel more relaxed as they lie down on the recliner. q: Will the recliner fit a 1-year-old, or a 5, 6, or 7 year old? Variations on this theme are easily the most frequently asked questions at sales sites. 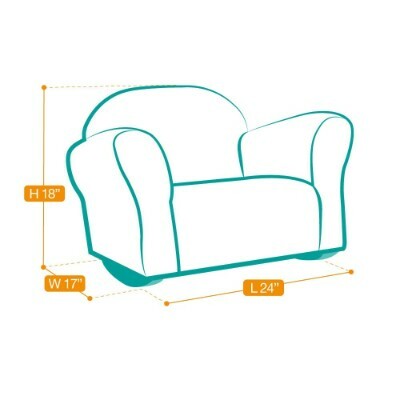 It is important to measure your child both in height and weight, then examine the chair dimensions, the FAQs and customer reviews on the sales site for the particular chair. Each chair is different and quite often the stated maximum has not matched the customer’s experience. 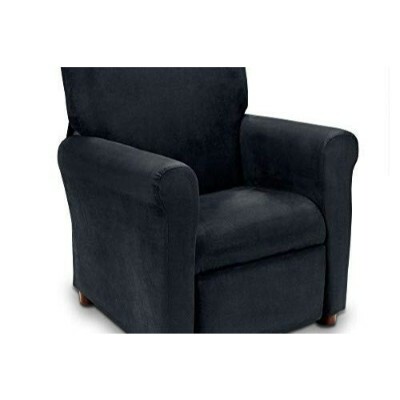 Most children’s recliners and chairs are designed with durability in mind. Manufacturers know that their target market plops, stamps, and takes running jumps at their product. They have no desire to take back broken furniture or see lots of complaints online. q: What upholstery should I choose? This is a personal preference. If maintenance is your primary concern, then go for leather or faux leather or flat-out vinyl. Microfiber also has good reports for clean-up, and is durable. Polyester tends to need mild soap and water, very soon after a spill occurs. All recliners have safety features built-in. Some have an upholstery cover between the footrest mechanism and little legs. Some require that the child be sitting in the chair before it reclines. None have the traditional lever on the side of the chair, but must be reclined with the strength of the back. Many require the strength of an adult to put the chair in a reclining position. q: How hard is clean-up? Much like sturdiness, these chairs are designed with children in mind. That said, vinyl or leather will obviously offer easier cleanup, with microfiber next, and polyester requiring the closest attention. Vinyl is by far the easiest to clean up, and it should be noted that modern vinyls can be quite comfortable. Most of the chairs reviewed come assembled. If the assembly is required, it’s generally pretty minor (per the FAQs and customer reviews). However, if you really don’t relate well to screwdrivers, check the customer comments and occasionally the product description.